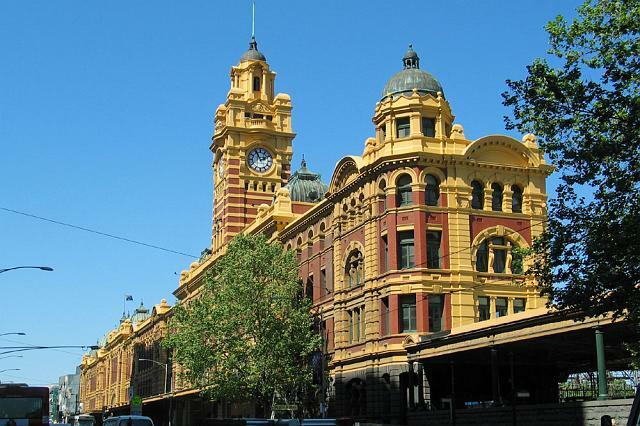 This huge eclectic Edwardian structure, with its domed entrance, clock tower and strident red brick façade is one of the best loved landmarks of Melbourne, and ‘under the clocks’ on the corner is a traditional meeting place. The hub of Melbourne’s suburban train system since the first railway opened in 1854, it lacked a suitably grand building for years. Plans for a station in 1880 were shelved, and the present building, by JW Fawcett and HPC Ashworth, won a design competition in 1899, and was completed in 1910. Attesting to its iconic status, the building has generated numerous urban legends, the most interesting being that the design as sent from England, and was actually intended for Bombay, but got mixed up in the post! Below are images of this Edwardian Baroque masterpiece throughout its history. 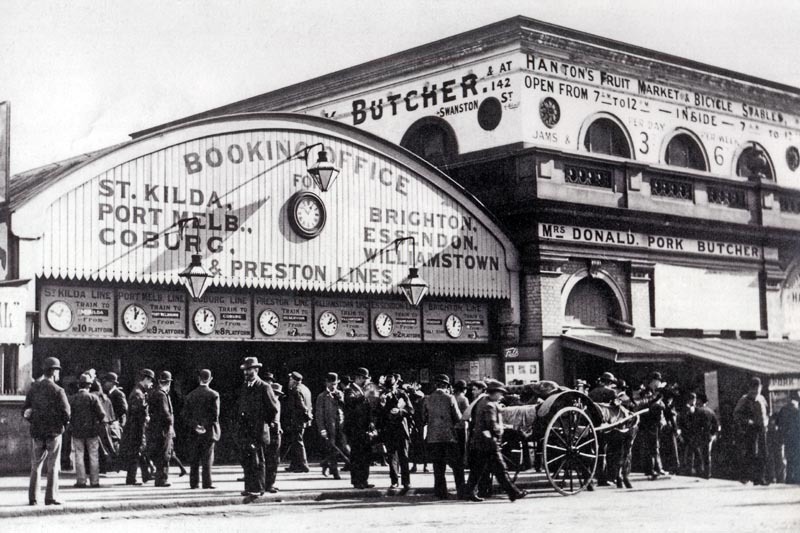 The original Flinders Street Station. 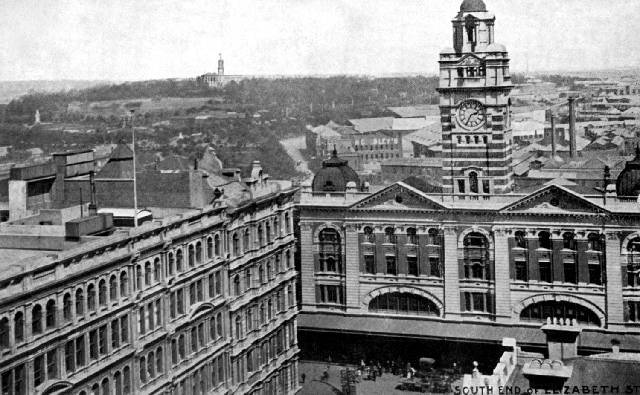 Above and below, the current Flinders Street Station built between 1905-10. Photograph taken in 1946 on a rainy day. Flinders Street station decorated for the Victorian Railways Centenary and royal visit. Recent postcard showing that the triangular pediments on top of the Flinders Street entrances have been removed. Above, an Edwardian postcard showing the Elizabeth Street entrance to Flinders Street station with pediments. Below a recent photograph I've taken of Flinders Street Station from Elizabeth Street, clearly showing the missing triangular pediments on both sides of the clock tower. Three more of my own. 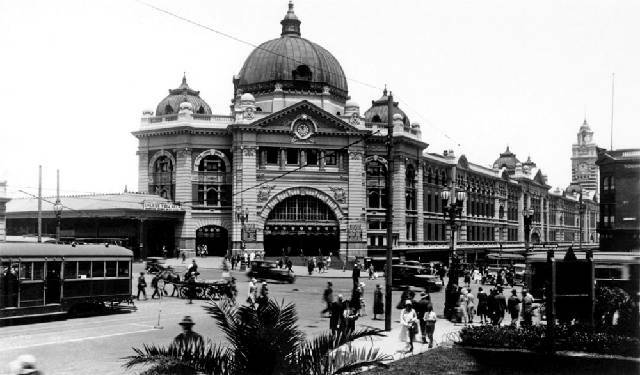 West end of station, Flinders Street. The clock tower, above and below. 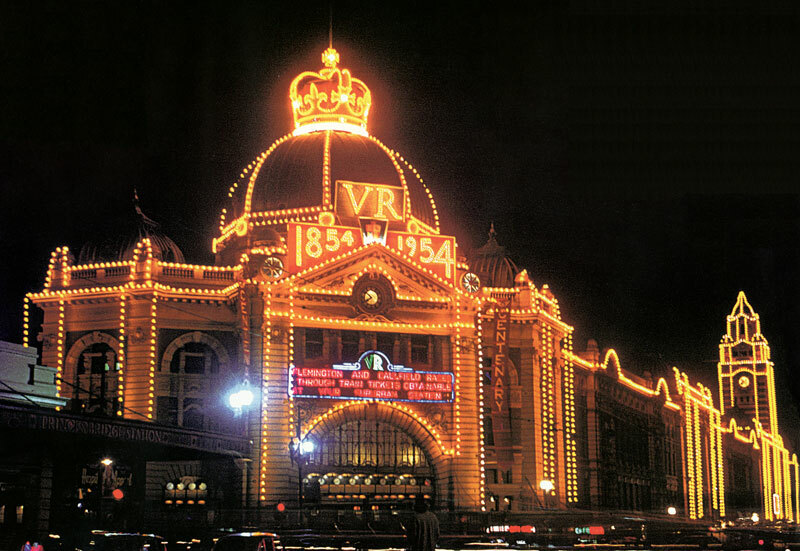 Festooned lighting on Flinders Street Station in 1954 to celebrate the centenary of Victorian Railways and also the 1954 Royal Visit. The interior of the large dome. 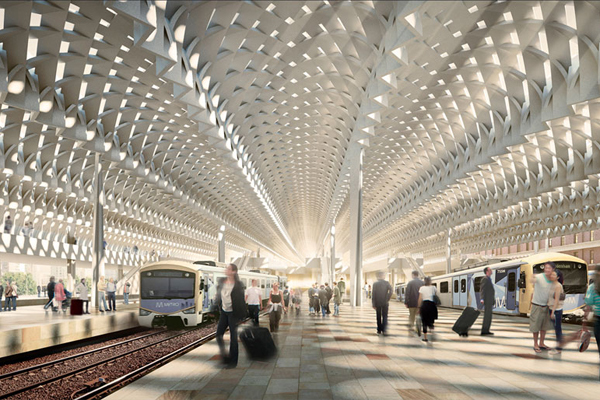 What could have been if the roof over the platforms was ever completed. Two more photographs of mine. Another postcard, one of many throughout the years. If ever one was to judge Melbourne's most popular landmark by postcard appearances, Flinders Street Station would win hands down! 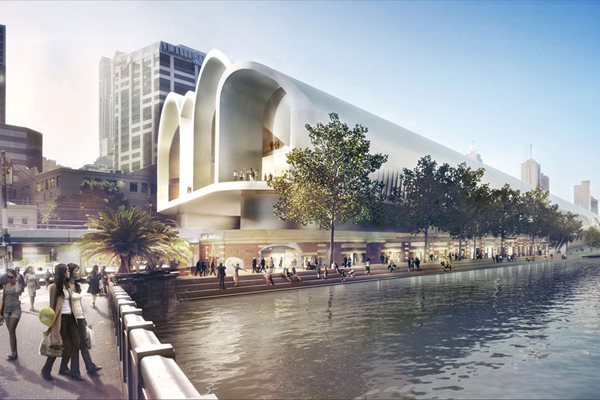 In November 2011, the Victorian Government launched a $1 million international design competition to rejuvenate and restore the station. In October 2012, after receiving 118 submissions, six finalists were selected. The public could vote for the people's choice award until August 5 and the jury's choice and people's choice winner were announced on August 8, 2013. 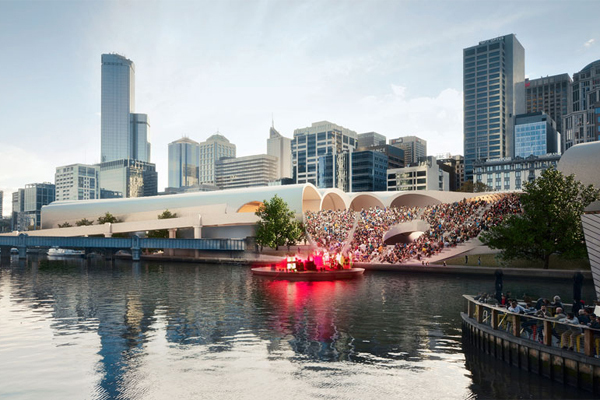 The competition winner was HASSELL + Herzog & de Meuron, while the people's choice winner were University of Melbourne students Eduardo Velasquez, Manuel Pineda and Santiago Medina. 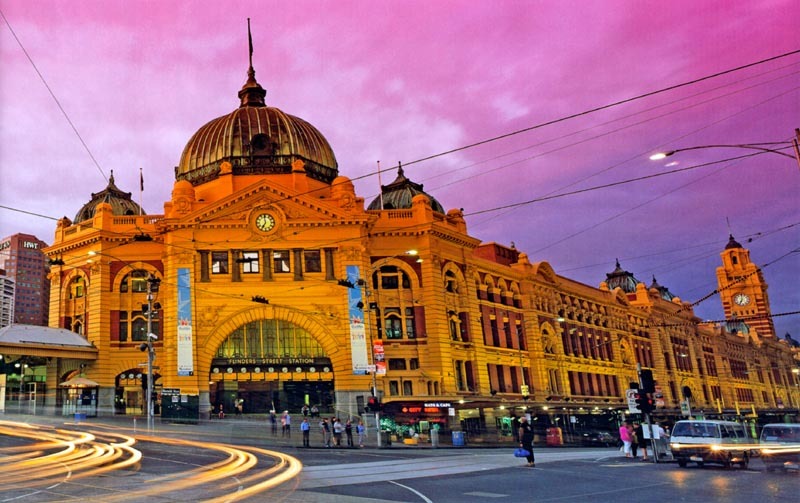 Whether it’s a packed station or an empty station, there’s something to stir the memory at Flinders Street Station. While essentially a station serving the suburban network, it nevertheless ranks as one of the world’s great railway terminals. Pocket size and although the photographs could have been printed better, the book is well researched. 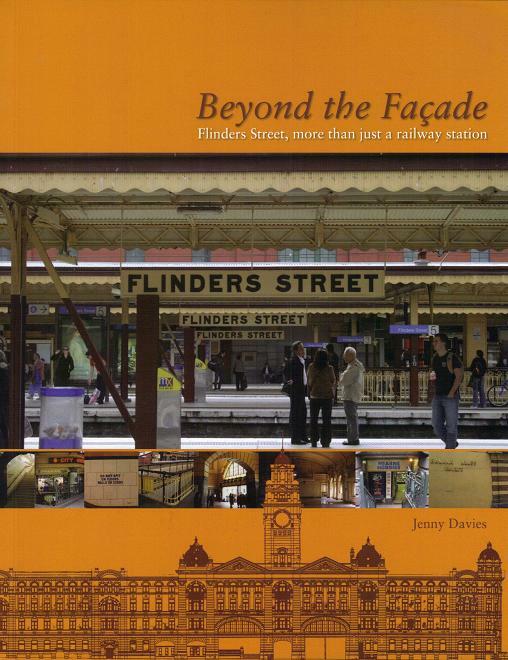 Beyond the Façade invites the reader to explore the many and varied uses of Flinders Street Station over and above its primary function as the central suburban rail terminus. 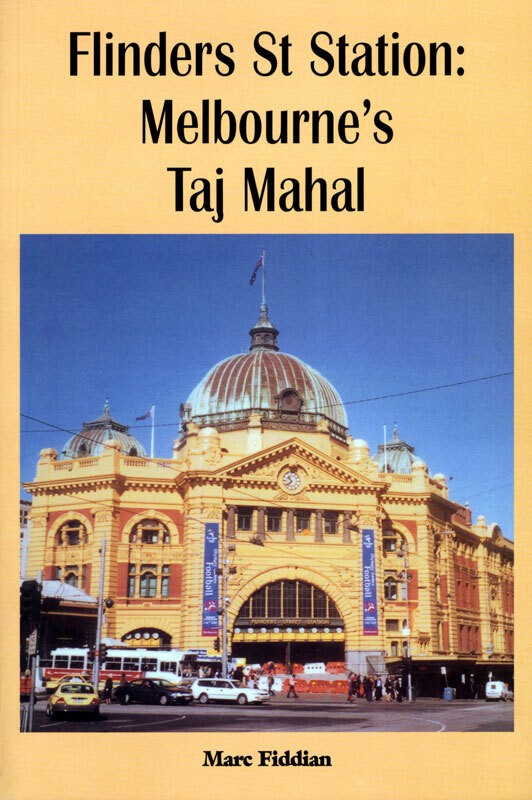 The definitive book on The Flinders Street Railway Station. 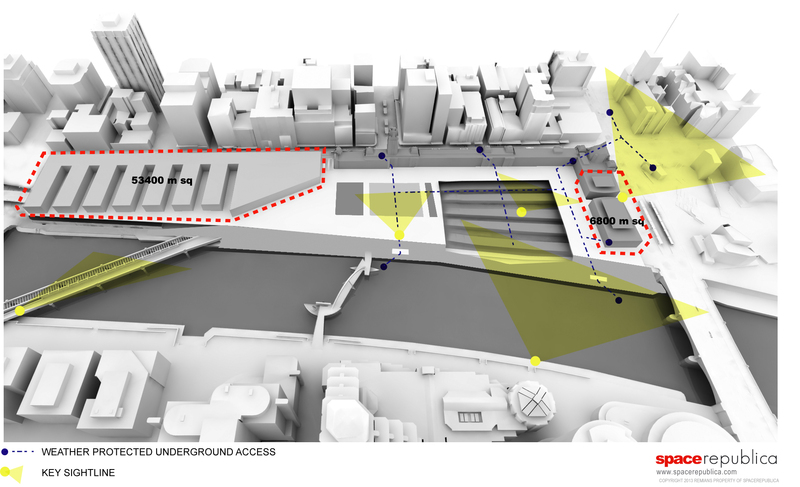 What do people think of another north/south underground walkway below the station connected rather than canopies which block views and things? Also what would you do with the structures on the left hand side with a red outline? 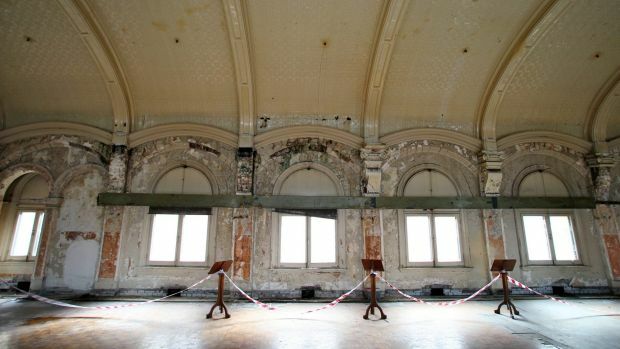 Flinders Street Station will get a $100 million facelift, including a restoration of its fabled but decaying ballroom. The station's leaking roof will be repaired and passenger facilities including toilets will be modernised in a project the state government estimates will take four to five years. Premier Daniel Andrews announced the $100 million project on radio station 3AW on Wednesday morning. 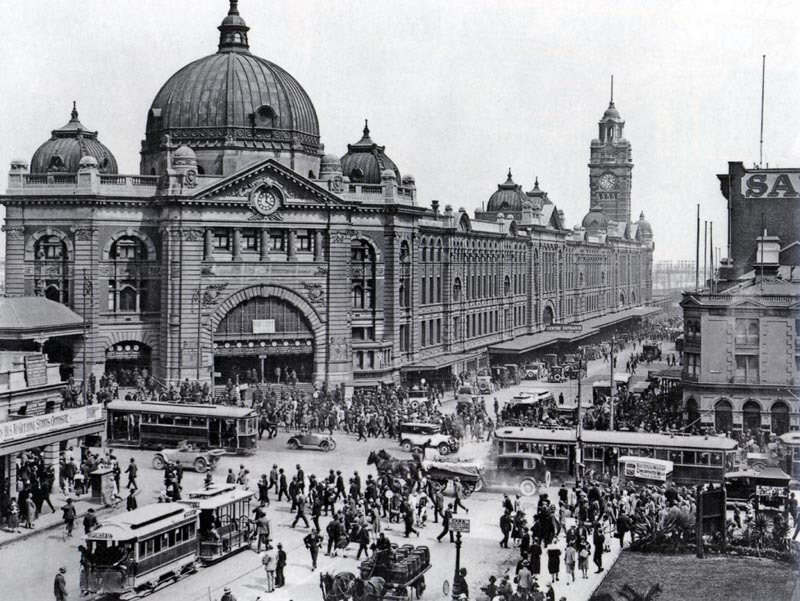 Photograph taken in the 1910s of the station along Flinders Street from west to east. Photograph taken in the 1930s. From Elizabeth Street facing the clock tower in the late 1950s. The new Lecture Hall at the official opening of the Victorian Railways Institute on Saturday 22 January 1910. 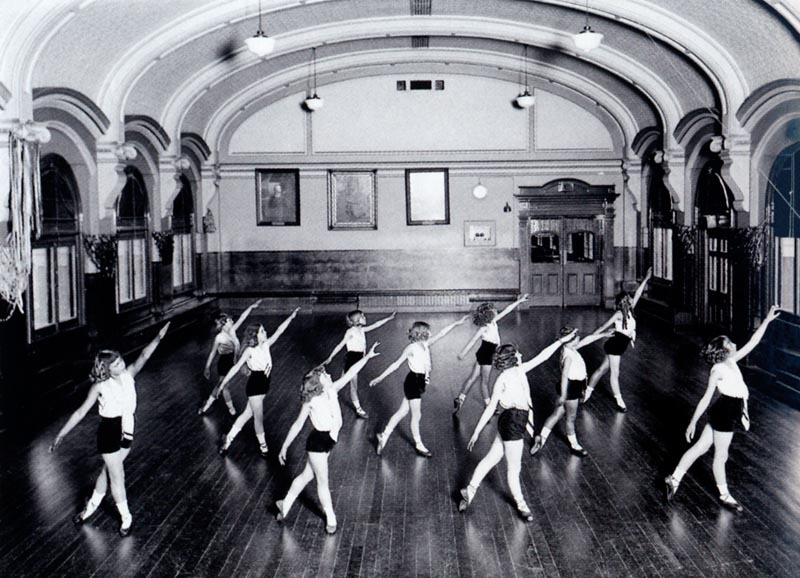 The updated Concert Hall (Ballroom) in 1927 with the addition of a ‘proscenium’ which had both fixed and movable pressed metal side panels and a head panel. 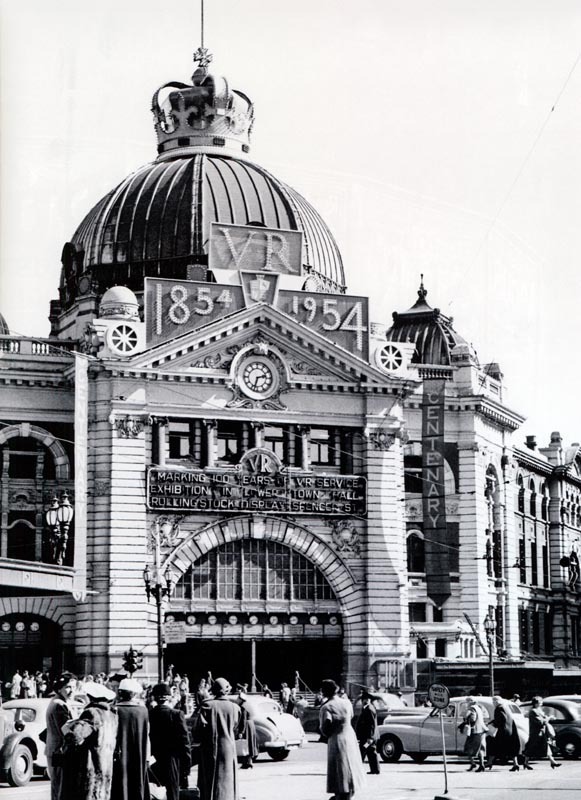 Flinders Street Station in 1954 to celebrate the 1954 Royal Visit. 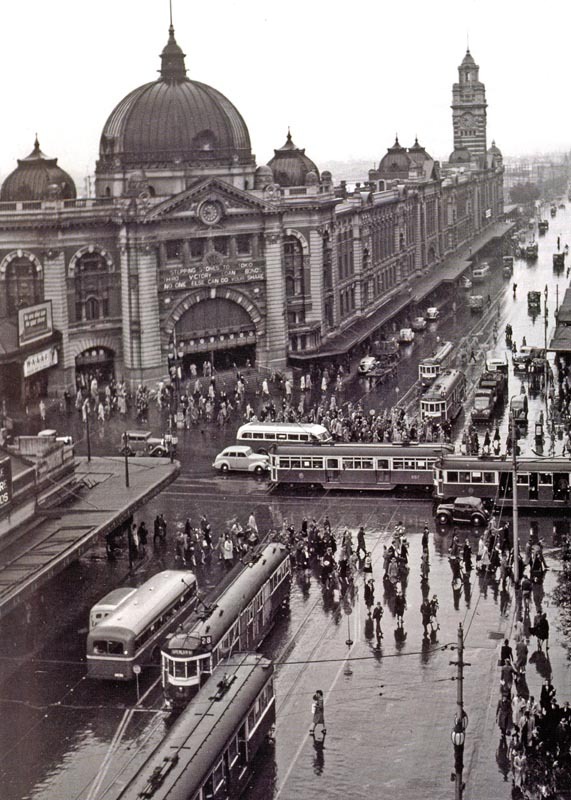 Flinders Street Station looking a little grubby in the 1960s. Flinders Street Station at night. My photograph. Postcard of Flinders Street Station during White Night Festival. 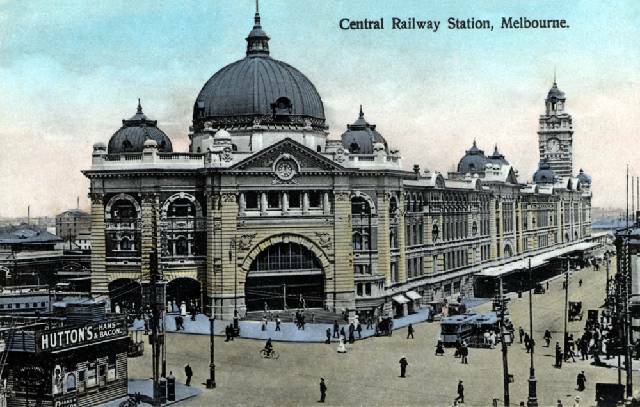 Another recent postcard featuring Flinders Street Station. Flinders Street Station on a silver dollar coin. Flinders Street Station on a commemorative medallion. City Hatters and granite blocks on the ground floor and basement level of Flinders Street. The ceiling just inside the main entrance. 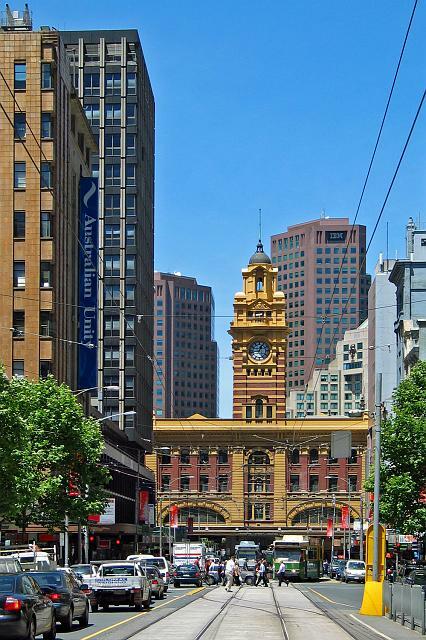 The clock tower over the Elizabeth Street entrance is not as famous as the dome, but viewed along Elizabeth Street, it's taller and much more prominent. Looking south down Elizabeth Street, near the Flinders Lane intersection ~ 1910s. The clock's central mechanism operates all four clock faces. The original clock tower at Elizabeth Street in the 1880s. It was operated by electricity. 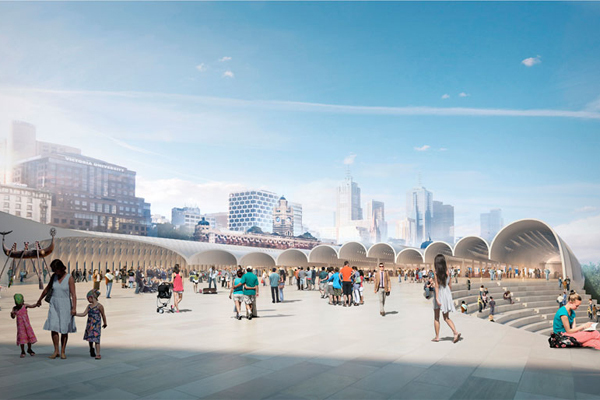 Works on the Andrews Labor Government’s $100 million restoration and upgrade of Flinders Street Station will begin next week. Acting Premier and Minister for Public Transport Jacinta Allan visited the Melbourne icon today to detail works to make the station safer, brighter and more user-friendly. From next week, lighting on platforms will be upgraded and redundant departure and signage boards will be removed. Further improvements – including better access to the station and platforms, upgrades to the dingy toilets and installation of bigger, more helpful passenger information boards – will follow over the coming months. These works are in addition to the new, faster, next-generation myki readers that were installed on all gates last month. Urgent works to repair the building’s crumbling exterior and clock tower, and fix the leaky roof will also begin in the coming months. I do wonder thought, when the 2, large, triangular pediments were removed from either side of the clock tower. I hope they consider rebuilding them. 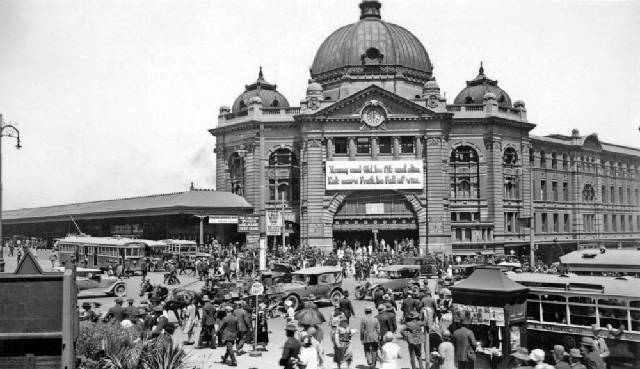 Flinders Street Station illuminated for Prince of Wales visit in 1920. 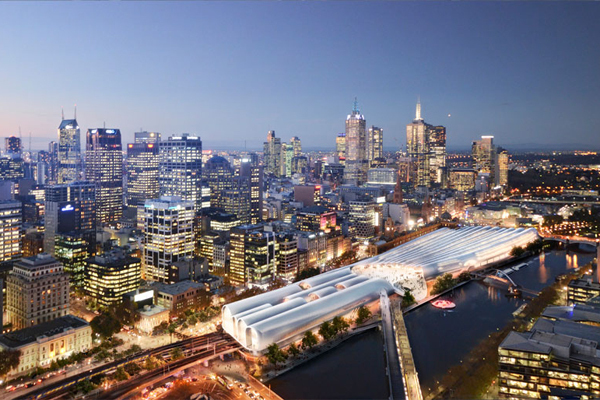 Work to save and restore Flinders Street Station – the heart of the city’s train network – is ramping up. Premier Daniel Andrews joined Minister for Public Transport Jacinta Allan today to announce the contract to transform Flinders Street Station, and reveal new details about the extensive improvements that will be delivered through the Andrews Labor Government’s $100 million project. Australian construction company Built Pty Ltd has been awarded the contract to refurbish the historic Administration Building. Works will begin in the coming weeks and will include fixing the leaky roof, restoring the crumbling façade and re-painting the more than 100 year-old building. 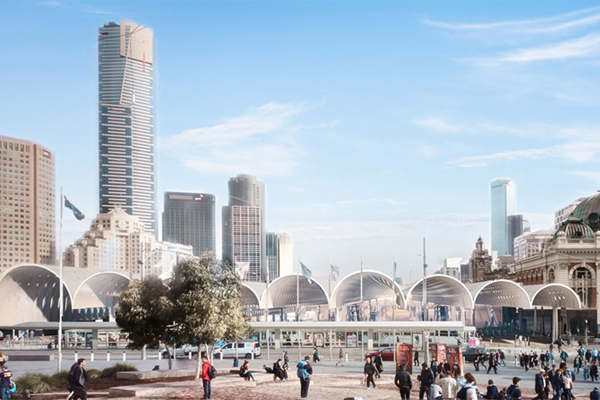 To improve the station for passengers, the concourse will be extended along Swanston Street, with new entrances at the western end of the station near Elizabeth Street, and in the Degraves Subway. 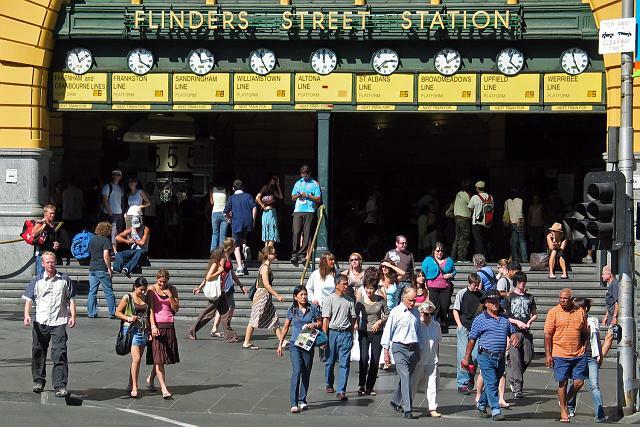 The main entrance on the corner of Swanston Street will be redesigned to make it easier to get in and out, and ticketing services across the station will be revamped to allow people to get through the gates faster. 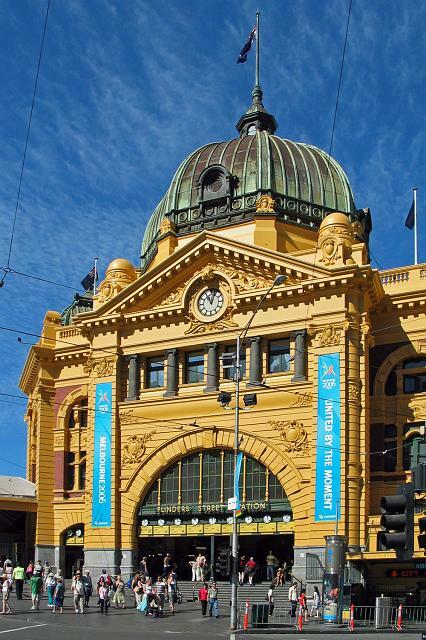 Flinders Street Station will be restored to its original 1910 colours as part of the Andrews Labor Government’s restoration and upgrade of the iconic Melbourne landmark. Minister for Major Projects Jacinta Allan announced today that the current mustard colour will become a lighter, stone colour, while the maroon sections and green trimmings will be darkened, to reflect the colours the historic station was painted when it first opened more than 100 years ago. 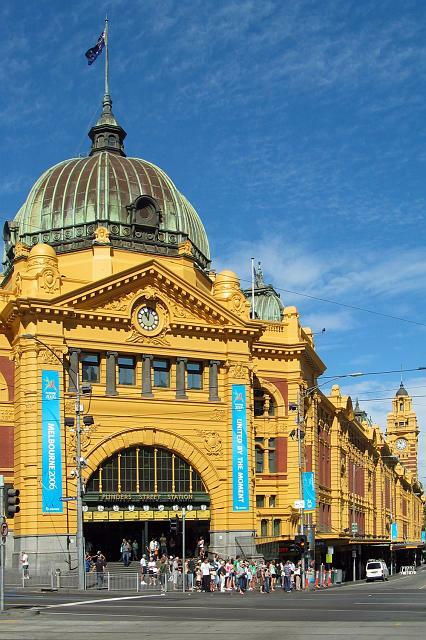 Flinders Street has been repainted five times since the early 1900s. Determining the original colours involved detailed forensic analysis by the University of Melbourne, to peel back the layers and find the original paint. Repainting will happen in sections, and is expected to be complete by the end of next year. As well as repairing and restoring Flinders Street Station’s crumbling façade, the Labor Government’s $100 million upgrade will fix the leaky roof, upgrade the entrances and make the busy station more functional for passengers. Work is already well underway. The dingy toilets on the main concourse have been refurbished, better lighting has been installed on the platforms and repairs have begun on the administrative building. The full upgrade is expected to be complete by the end of 2018. The Andrews Labor Government’s $100 million project to save and clean up Flinders Street Station is ramping up. From this evening, scaffolding will start being installed on Flinders Street at the western end of the Administration Building, to enable extensive restoration works. These works will include repairs to the façade of the iconic building and repainting it to its original 1910 colours. The scaffolding will be constructed above the station awning, supported by ground-level towers running along the building’s northern façade. For the safety of the public and workers, a construction zone will be fenced off underneath the scaffolding, which will reach just over a metre from the building. Shops along the Flinders Street side of the Administration Building will remain open throughout the works, and pedestrians will still be able to use the footpath, although it will be narrower than it is currently. Scaffolding has already been installed on the Platform 1 side of the Administration Building to allow roof replacement, waterproofing and painting works to be carried out. Works completed to date include the refurbishment of toilets on the main concourse and upgrades to lighting across all platforms. Planning is well progressed to refurbish the Elizabeth Street subway toilets and build a new entrance to Platform 10 at the western end of the station. These works are expected to start in the next few months. The scaffolding on both sides of the Administration Building will remain in place until 2018. 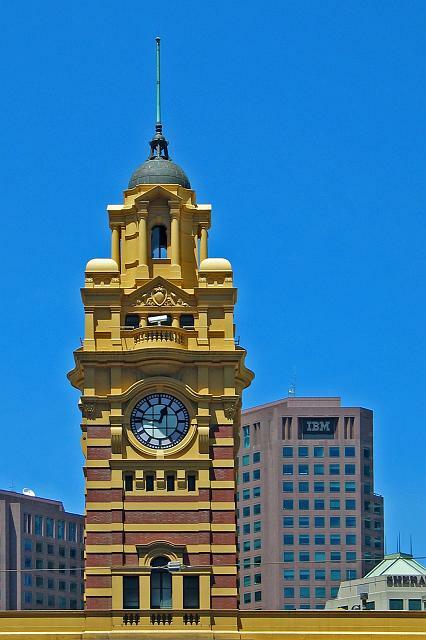 Flinders Street’s beloved tower clock is running again after its first restoration in more than a century. The Elizabeth St Tower Clock was made in 1907 by local clockmaker F. Zeigler and with four faces, each 11 feet in diameter – it is the largest clock in Victoria. The Tower Clock was the master clock for the entire Victorian railway system – transmitting the correct time out to hundreds of stations by telegraph signals. Since work began on the clock tower in mid-2017, the glass clock faces have been restored, the inner workings serviced, new safety ladders have been installed and the entire structure has been strengthened with an ingenious cable system. This work is all part of the Andrews Labor Government’s $100 million refurbishment of Flinders Street, which has restored the exterior of the Administration Building and seen it returned to its original 1910 colour. Around the building more than 5,000 litres of paint and 3.5 tons of mortar have been used, while more than 700 windows have been restored and repainted. The roof has been waterproofed and the whole building stabilised to prevent further deterioration. Elsewhere around the station, works have been completed on the toilets on the main concourse and at the Elizabeth Street Subway and improvements have been made to platform amenity and lighting. A new entrance to Platform 10 is currently being built and will be completed in April. Minister for Public Transport and Major Projects Jacinta Allan today inspected works on the historic dome, built in 1910 and rejuvenated as part of the Andrews Labor Government’s $100 million upgrade of Flinders Street Station. The space, which is normally off-limits, features a high domed ceiling with an intricate steel frame and beautiful wood panelling. More than 10 tonnes of pigeon poo was removed from the dome during cleaning. 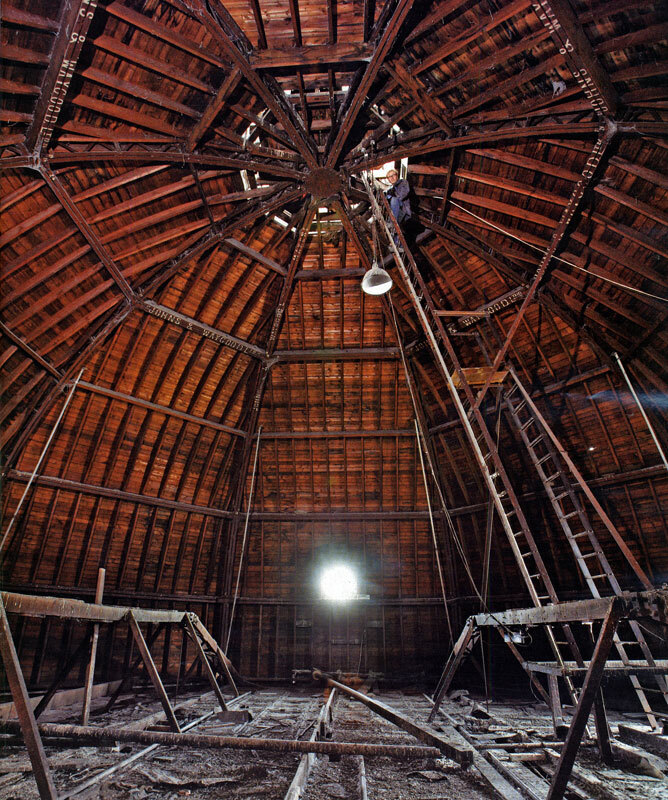 The work revealed links back to the dome’s original builders, with an ornate copperplate signature found carved into the dome’s exterior and a pair of spare flag poles left inside the structure. Elsewhere in the Administration Building, the ballroom roof is being fully restored and has been stripped back to its bare structure to make it water proof and remove hazardous materials. Work is also in full swing to improve the public areas of the station, with the new Platform 10 entrance nearly finished and works to restore and upgrade the Elizabeth Street and Degraves Street subways to begin in late April. Work to improve passenger flow and create more space on the platforms by reconfiguring or removing vending machines, windbreaks and kiosks is also beginning next month. The exterior renovation is really good. But I really hope the whole thing, inside and out, end to end, gets more love at some point. What we've had seems more cosmetic than anything. There must be huge potential for interior spaces (I will restate my recommendation to all powerful people that the central library be rehoused here) and there's all that derelict-looking space further down from the platforms that, at the very least, could be cleaned up.